"Between the late 1960s and '80s, when American artists were making big Minimalist and Neoexpressionist statements, Hannelore Baron stood out for her modest-size works, notable for their quiet, emotional power, and anachronistic charm. But Baron, who died at the age of 61 in 1987, had always kept herself apart form the art world, producing small-scale works that appear fraught with a tortured personal history. "The 23 box constructions and collages on view here recalled such masters of assemblage as Rauschenberg, Cornell, and Schwitters. 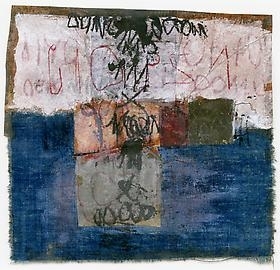 In individual works (all untitled and dating from the mid-1970s to the mid-'80s), surfaces are scratched and incised with incomprehensible ciphers; pieces of worn fabric form a backdrop for cartoonish animals; reliquary-like boxes are held together with metal bindings; and some objects appear to have been lightly blasted with a blowtorch. As in Cornell's boxes, we sense an obsessive need to convey a hermetic language of highly intimate fantasies and nightmares.